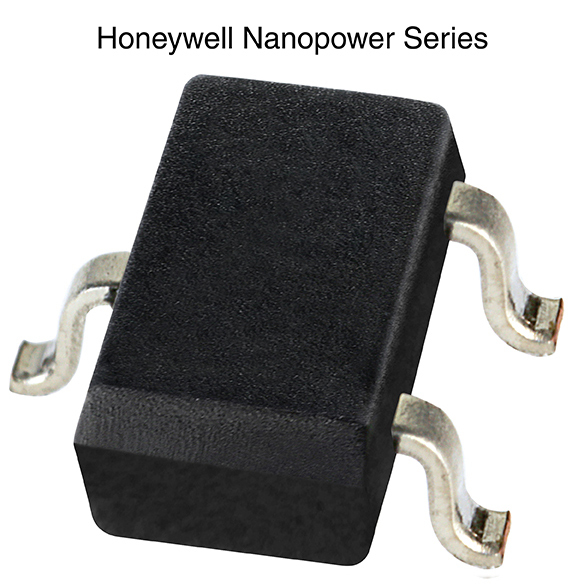 MINNEAPOLIS – May 19, 2014 - Honeywell (NYSE:HON) today introduced the industry’s first Nanopower Anisotropic Magnetoresistive Sensor ICs that provide the highest level of magnetic sensitivity (as low as 7 Gauss typical) while requiring nanopower (360 nA). When compared to other widely used magnetic technologies, these sensors offer design engineers a number of advantages. Smaller and more durable and reliable than reed switches, at the same sensitivity and essentially the same cost, the new Nanopower Series Magnetoresistive Sensor ICs are ideal for battery powered applications where previously only reed switches could be used due to very low power requirements and large air gap needs. Compared with Hall-effect sensors, the new Nanopower Series Magnetoresistive Sensor ICs’ higher sensitivity can allow the ability to sense air gaps two times the distance of Hall-effect sensors. The higher sensitivity improves design flexibility and can offer significant application cost savings by utilizing smaller or lower strength magnets. white goods such as dishwashers, microwaves, washing machines, refrigerators and coffee machines, and medical equipment such as hospital beds, medication dispensing cabinets, infusion pumps, and consumer electronics such as notebook computers, tablets, and cordless speakers. Omnipolarity allows the sensor to be activated by either a north or south pole, eliminating the need for the magnet polarity to be identified, simplifying installation and potentially reducing system cost. The push-pull (CMOS) output does not require external resistors, making it easier and more cost-effective to operate. The non-chopper stabilized design eliminates electrical noise generated by the sensor. The subminiature SOT-23 surface mount package, supplied on tape and reel (3000 units per reel), is smaller than most reed switches, allowing for use in automated pick-and-place component installation and can reduce production costs.